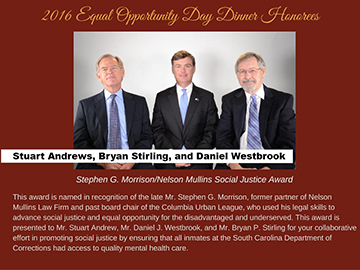 COLUMBIA, S.C. (Nov. 4, 2016)–The Columbia Urban League has honored Nelson Mullins Riley & Scarborough Columbia partners Stuart M. Andrews, Jr. and Daniel J. Westbrook, along with S.C. Department of Corrections Director Bryan Stirling, with their Stephen G. Morrison/Nelson Mullins Social Justice Award. The award recognizes the collaborative effort of the three to ensure all prison inmates have access to quality mental healthcare. Click here to read full release. 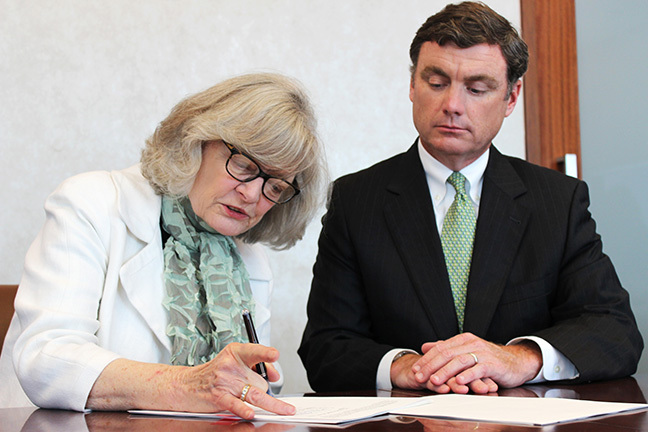 Gloria Prevost, executive director of Protection and Advocacy for People with Disabilities, Inc., and Bryan Stirling, SCDC director, sign the agreement. (June 1, 2016)--After long-fought litigation and two years of negotiations, a settlement agreement has been struck that could end what Circuit Judge Michael Baxley called the unconstitutional treatment of an estimated 3,500 severely mentally ill offenders in the S. C. Department of Corrections (SCDC) facilities. Click here to read the full news release. The S.C. Department of Corrections mental health program is "inherently flawed and systemically deficient in all major areas," and prison officials should address the constitutional deficiencies and provide more humane treatment of prison inmates with serious mental health illnesses, a circuit court judge ruled January 8, 2014. Circuit Judge Michael Baxley said in his ruling that the five-week trial of T.R., P.R., K.W., et al. v. South Carolina Department of Corrections, et al. was the most troubling of the 70,000 cases to come before him in the past 14 years. "The evidence in this case has proved that inmates have died in the South Carolina Department of Corrections for lack of basic mental health care, and hundreds more remain substantially at risk for serious physical injury, mental decompensation, and profound, permanent mental illness. As a society, and as citizen jurors and judges make decisions that send people to prison, we have the reasonable expectation that those in prison – even though it is prison – will have their basic health needs met by the state that imprisons them. And this includes mental health. The evidence in this case has shown that expectation to be misplaced in many instances," Baxley wrote. The judge's order requires the corrections department to remedy constitutional violations by submitting a remedial plan within six months to include: development of screening and mental health treatment programs; a plan to employ sufficient mental health professionals; a plan to maintain treatment records and administer psychotropic medication with appropriate supervision and periodic evaluation; and a program to identify, treat, and supervise inmates at risk for suicide. Protection and Advocacy for People with Disabilities, Inc., on behalf of inmates with serious mental health needs filed a class-action lawsuit in June 2005 alleging inadequate mental health treatment for prisoners held statewide by the S.C. Department of Corrections. The lawsuit did not seek financial damages; rather, it asked the court to require the department to design and maintain a program that provides adequate treatment of inmates with mental illness. South Carolina houses some 23,000 inmates, with more than 3,000 inmates with serious mental illness diagnoses (S.C. Department of Corrections data as of June 30, 2011). "We are greatly pleased with the outcome and call on the Department of Corrections and the Legislature to take steps immediately toward meaningful reform," said Gloria Prevost, P&A executive director. "As the judge pointed out, the evidence is overwhelming that the Department of Corrections has known for over a decade that its system exposes seriously mentally ill inmates to a substantial risk of serious harm. Inmates with serious mental health illnesses are dying needlessly and treated inhumanely. We want the state to provide the resources to allow the Department of Corrections to implement meaningful change and the Department to be fully committed to meeting the medical needs of inmates with serious mental illness." Ashley Twombley, chair of the board of directors of P&A, noted that "the 19th century Russian novelist Fyodor Dostoevsky said, 'The degree of civilization of a society can be judged by entering its prisons.' The idea is no less true today. Judge Baxley's order gives us reason to be ashamed of our state's treatment of mentally ill men and women. On the other hand, the ruling gives us hope they will be given proper medical care and treated with basic human decency." In his conclusion, Judge Baxley noted the eight-year length of the litigation. "Rather than accept the obvious at some point and come forward in a meaningful way to try and improve its mental health system, Defendants have fought this case tooth and nail…The hundreds of thousands of tax dollars spent defending this lawsuit, at trial and most likely now on appeal, would be better expended to improve mental health services delivery at SCDC," Baxley wrote. The judge noted that providing mental health services to inmates has significance beyond the prison walls. "What happens at the Department of Corrections impacts all of us, whether it is from the discharge of untreated seriously mentally ill individuals from prison into the general population, or tremendously increased costs for treatment and care that might have been prevented, or the needless increase in human suffering when use of force replaces medical care. The decisions of our Courts reflect the values of our society. To that end, our state can no longer tolerate a mental health system at the South Carolina Department of Corrections that has broken down due to lack of finances and focus," he wrote. "This ruling reinforces the evidence that the SC Department of Corrections is in crisis and has been in crisis for more than a decade as several studies have shown," said Joy Jay, executive director of Mental Health of America for South Carolina who served as guardian for the prisoners. "People are dying needlessly in our prisons because of poor treatment. The public should also view this as a public safety issue in that inmates with serious mental health issues who receive no or very abusive treatment will return to their communities worse than when they went in." National experts and more than 10 inmates testified on prison conditions, including long-term solitary confinement – in one case from February 2001 – February 2008; multiple hours of restraint in crucifix positions with no bathroom breaks; placement naked in shower stalls, interview booths, and holding cells for hours and days with no toilets; and routine and excessive use of pepper spray. During the five-week trial that began in February 2012, Baxley heard arguments from Nelson Mullins Riley & Scarborough attorneys Dan Westbrook and Stuart Andrews, representing the plaintiffs. Mr. Westbrook argued at closing that the evidence presented at trial proved that SCDC's mental health system was constitutionally deficient in such areas as crisis intervention, solitary confinement, clinical staffing, record keeping, mental health screening, use of force, and medication administration. Mr. Westbrook argued that SCDC knows of the deficiencies and has failed to correct them. SCDC attorney Andrew Lindemann of Davidson & Lindemann argued that the court should dismiss the case on a variety of legal grounds, including lack of standing and the separation of powers doctrine. Mr. Lindemann also argued that SCDC should not be held liable when it cannot control its funding. Mr. Lindemann further argued that SCDC has improved mental health services in recent years. P&A is an independent, statewide, nonprofit corporation that protects and advances the legal rights of people with disabilities. The case is T.R., P.R., K.W., and A.M. on behalf of themselves and others similarly situated; and Protection and Advocacy for People with Disabilities, Inc., v. South Carolina Department of Corrections; and William R. Byars, Jr., as Agency Director of the South Carolina Department of Corrections. The mental health program at SCDC is severely understaffed, particularly with respect to mental health professionals, and impacts the proper administration of services from Reception and Evaluation through discharge. Seriously mentally ill inmates are exposed to a disproportionate use of force and segregation (solitary confinement) when compared with non-mentally ill inmates. These conditions have contributed to the deaths of multiple inmates in segregation, while placing other inmates and staff at risk. Mental health services lack a sufficiently systematic program that maintains accurate and complete treatment records. SCDC's screening and evaluation process is ineffective in identifying inmates with serious mental illness and in providing those it does identify with timely treatment. Administration of psychotropic medications is inadequately supervised and evaluated. SCDC's current policies and practices concerning suicide prevention and crisis intervention are inadequate and have resulted in the unnecessary loss of life among seriously mentally ill inmates. Copyright © 2011 Mental Health for Inmates.